Fear of Beauty and this blog describe the role of the provincial reconstruction teams - groups of civilian and military specialists - in Afghanistan as they provide technical advice and support in agriculture, education, health care, construction and many other areas. Of course, some teams have produced great achievements and others have been less successful. Philosophies differ, as demonstrated by the quarrels between Cameron and Mita in Fear of Beauty. So much depends how the teams worked with local governments. "From NATO's point of view, the contemporary blurring of boundaries between civilian and military actions in peacebuilding operations can be seen as an opportunity to bring into the sphere of humanitarian activity some of the advantages of the military culture of efficiency. But from the perspective of many NGOs, the existing blurring of boundaries is a deeply problematic development that should be contained and, as much as possible, reversed. What is needed, according to this logic, is a clear separation between the military and humanitarian norms and activities, and an affirmation of the leading role of humanitarian organizations in the definition of the rules of the game in activities that involve assistance to civilians in war-torn countries." Gheciu concludes that a lack of coordination will only lead to more disagreements, wasted resources and "growing disenchantment both in the territories undergoing postconflict reconstruction and in the international community - with international peacebuilding operations." Strong opinions are the norm. People quarrel, institutions quarrel - and with luck, communities progress. It's tough to kill the entrepreneurial spirit, though the Taliban in Afghanistan sure gave it a good try before 2001. Project Artemis, hosted by the Thunderbird School of Global Management in Arizona, hosts Afghan women for an intensive two-week business skills course. Matthew Hilburn, reporting for Voice of America, describes a woman who ran a secret honey-making business during the Taliban era. Women entering the program run businesses for embroidery and saffron. 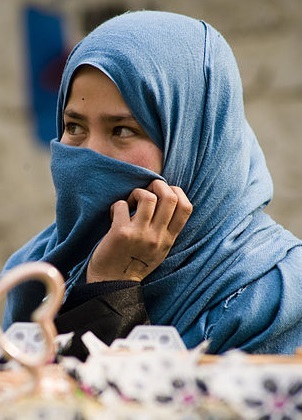 Hilburn writes: "While Afghan businesswomen still have many hurdles to overcome - they still may need to rely on men for many external dealings such as negotiations and making deliveries - Artemis is making progress toward changing how women are viewed by society at large. Artemis pairs the entrepreneurs with mentors. Check out the stories on their site - again, they are inspiring. The project operates in other countries, too, including Peru, Jordan and Pakistan. 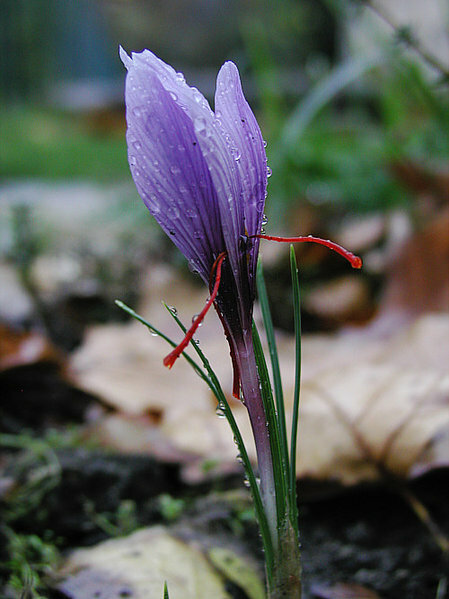 Secrecy and saffron are part of the plot of Fear of Beauty. Trade, business, a sense of purpose provide security and stability for communities. 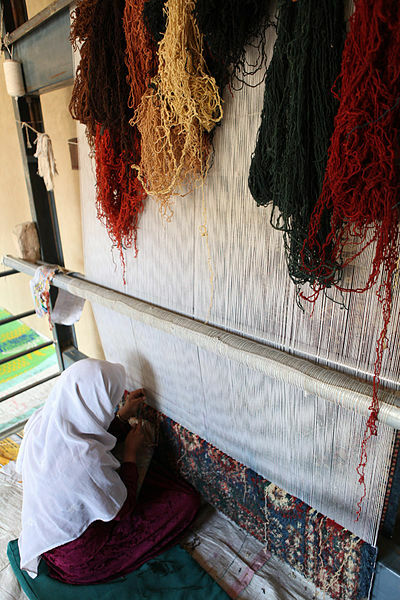 Photo of Afghan woman weaving carpet courtesy of Wikimedia Commons and US Marine Corps. The only recourse against bullies is the rule of law, according to professionals in the West. But sometimes the bullies oversee judicial systems. So naturally a problem emerges when wronged individuals do not have access to fair courts. "An estimated 80 percent of all criminal and civil disputes in Afghanistan are resolved outside the formal legal system through various community forums known as shuras, jirgas, and jalasas. Disputants often prefer to have their cases resolved by community dispute resolution mechanisms that are popularly viewed by most Afghans as more accessible, less costly, more legitimate, and less corrupt than government courts. Many Afghans find the latter more in tune with cultural values promoting consensus and reconciliation, rather than punitive retribution alone." Unfortunately, half the population - women - are excluded from overseeing these proceedings and the decisions rendered. Women still prefer the traditional forms of resolution. The institute also takes pains to point out that individual interpretations can vary. One adjudicator may emphasize forgiveness and another emphasizes compensation or punishment. Evidence can be found in acceptable documents to support a range of alternative narratives: "USIP seeks to establish an understanding of the Afghan-Islamic normative values of Islamic jurisprudence. USIP is also expanding its programming to examine land dispute resolution and promote efforts to improve community legal awareness of rights and criminal law by engaging youth and media." The rule of law is essential for Afghanistan to achieve security and stability. The US Department of State also lists other programs on the rule of law. 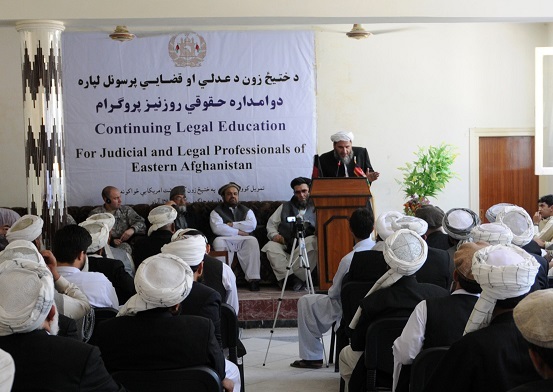 Photo of Kunar Judge Ansarullah Mawlawizada updates supreme court judges on Afghan law in 2010, courtesy of US Army Spc. Richard Daniels and Wikimedia Commons. Researchers with the Centre for Agricultural Research in the Dry Areas studied gender roles in rural Afghanistan and found that women participate less than men do. Women are more likely to participate in livestock-related activities than raising crops. Srinivas Tavva and five other researchers conducted interviews on participation in seven villages from Nangarhar Province and seven in Baghlan Province. "Age, social stigmas, poverty and shortage of labour influence the gender division of labour, decision-making ability and participation in Afghanistan's farm and non-farm activities." We must wonder if this is especially true of dry areas. "Dry areas cover 41% of the world’s land area and are home to one-third of the global population," notes the ICARDA site. "About 16% of this population lives in chronic poverty, particularly in marginal rainfed areas. The dry areas are challenged by rapid population growth, frequent droughts, high climatic variability, land degradation and desertification, and widespread poverty." In Fear of Beauty and its imaginary village with a more temperate climate, women did most of the work tending diverse crops and boys tended sheep and goats. As we have noted before, there are not many thrillers that focus on farming. The plot would have been impossible without women's participation in everyday farming tasks. As shown by the photo from USAID, the scenario of women doing farmwork is feasible. And the photo, with no location noted, does not appear to be a dry area. And Olivier De Schutter confirms the feasibility of Laashekoh, too, with an opinion essay, "The Feminization of Farming," in The New York Times. The UN special rapporteur on the right to food explains that more men are migrating from rural to urban areas, leaving women behind to run farming operations, too often as unpaid work. 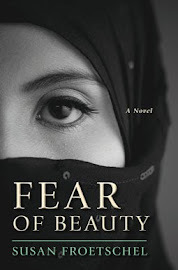 The essay also points to work being done in Bangladesh, as represented by Mita, the aid worker in Fear of Beauty. 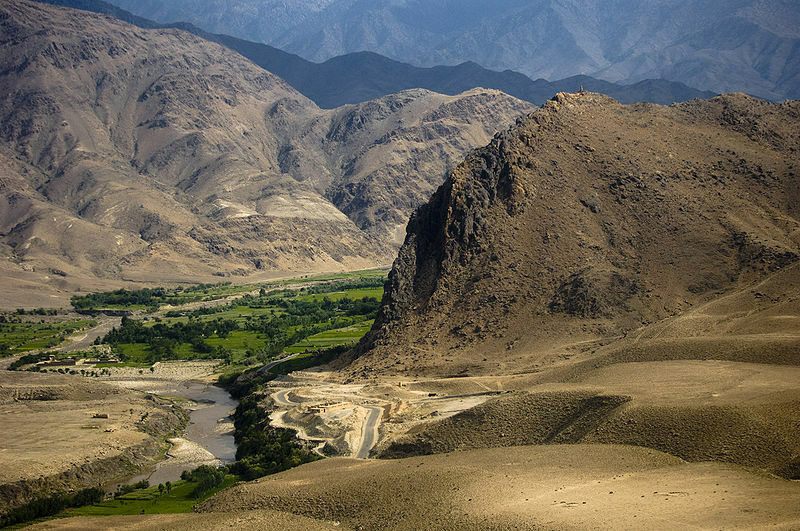 The novel strives to represent globalization's many conflicts in a tiny and imaginary village of Afghanistan. De Schutter concludes: "Recognizing the burden that the feminization of global farming places on women requires us to overturn longstanding gender norms that have kept women down even as they feed more and more of the world." Photo courtesy of Wikimedia Commons and USAID. 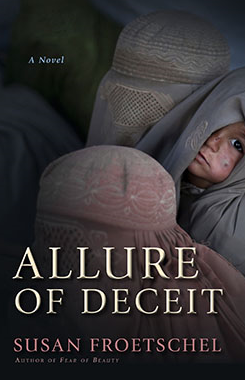 So many ask why in the world did I choose to set a mystery in Afghanistan, and I explain this weekend at Poe's Deadly Daughters. "The old advice is write what you know, but I’d say write what you care about, especially when you’re surprised by how much you care. Afghanistan tugged at my imagination long before the US invaded in late 2001. Before news emerged of Osama bin Laden’s terrorist-training camps or the Taliban government blew up the giant Buddha statues of Bamiyan." It was hard to imagine that the country could so quickly shift from one renowned for its hospitality to one known for religious extremism, fear of history and regular bullying of women and children. "For this avid reader, illiteracy and bullying are the stuff of nightmares," and Afghanistan allowed me to explore how communities, particularly women, might respond. I'm also looking forward to talking with David Alpern 1 pm today about Afghanistan. "Each week, FOR YOUR EARS ONLY broadcasts to stations coast-to-coast and to U.S. military personnel in 177 nations via the Pentagon's American Forces Radio Network." Photo of Afghanistan contrasts, courtesy of US Air Force Staff Sgt. Samuel Morse and Wikimedia Commons. The Afghan women will be all right. A post from Patheos by eren both assures and chides US, Canadian and other pundits fretting about the future of Afghan women even as Western troops withdraw. The post bashes the colonial notion of noble savage, the notion that Afghan's women voters will vigorously pursue democracy. "I think it is quite important to recognize that reconstruction is a process where gender relations will be shifted, changed and re-arranged," eren notes. "Yes, there is a lot to do. Afghanistan remains the most dangerous country for women today and education for both men and women may be the only way to end prevailing domestic violence." In all the shifting, individuals must define happiness on their own ... eren goes on to suggest that the time has come "to hand the country back to its people, with no expectations of 'perfect Afghani women' and no further money for weapons." Globalization is tricky and exposes the dangers of stereotyping. The ideal society varies among women, among communities, so much so that the shaping and reshaping is constant and yet one ideal can never be achieved. Photo courtesy of Wikimedia Commons and Petty Officer 2nd Class Ernesto Hernandez Fonte during NATO training mission. "I was tired of always seeing the same discourse on Afghan women, as submissive, as victims," Rahimai says.... "When I go to Afghanistan, I meet women of extraordinary might. they have a presence, socially, politically, culturally speaking.... Even in Parliament, it is the women who call out all the war criminals." Women must evade the control from others to avoid being victims. That often requires keeping secrets and hiding achievements. The film will come to the United States this summer. Afghan women do not necessarily resent their fathers, explains Stacy Parker Le Melle, workshop director for the Afghan Women's Writing Project in the Huffington Post. "As an outsider, it had been easy for me to make assumptions of how fathers treated their daughters," she writes. "It had been easy to assume that because one man treats his daughter like cloth, to be bought and sold, as writer Lena once described, that all Afghan fathers are like this. But clearly this is not the case." Sofi recalls her last memories of her father in Fear of Beauty. Those memories of his love give her strength and confidence. The motto for the writing project is "To tell one's story is a human right." And those stories are inspiring. 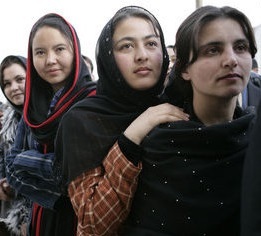 Photo of women waiting outside the U.S. Embassy in Kabul in 2006, courtesy of Wikimedia Commons and the US government. As the US withdraws troops from Afghanistan, nonprofits will be left behind, trying to monitor and protect human rights. Using threats or rumors, some conservatives who reject women's rights will try to chase off these nonprofit organizations. One dilemma for Afghans is the reliance on opium as a crop. The country is the world's major supplier and for some communities it's an economic staple. Community leaders worry about the loss of a major crop and also detest the complications, especially addiction, that come with growing opium. The illegal crop provides little in the way of stability or economic certainty, not with foreign and Afghan troops working to destroy the fields. The loss of a harvest can lead to debt for families and early and inappropriate marriages for daughters - which are closer to trafficking than a partnership for starting families - explains Emily Simons for The International. The International Organization for Migration monitors and issues reports trafficking, debt marriage and other issues of migration. 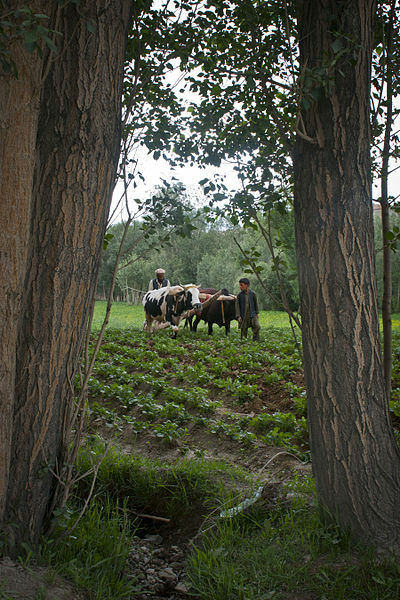 Sources for Simons suggest that "Afghan policymakers have yet to find a solution that will protect farmers' families while also trying to end the opium trade." Neighboring countries can help by reducing subsidies on their own agricultural products and encouraging Afghanistan to diversify its harvests - growing pomegranates, saffron, wheat and more. The neighboring countries an than purchase the surplus legal crops produced by Afghan farmers, helping families and their daughters. Those who profit from opium and the old ways will resist new crops. Another provincial reconstruction team project: With potatoes becoming major cash crop, a father and son farm tend to the root vegetables in Bamyan Province. Photo courtesy of Wikimedia Commons and the US Army. Interest in infrastructure development for distant lands comes and goes, relying on the political, economic and security interests of not just one country, but two and sometimes more. 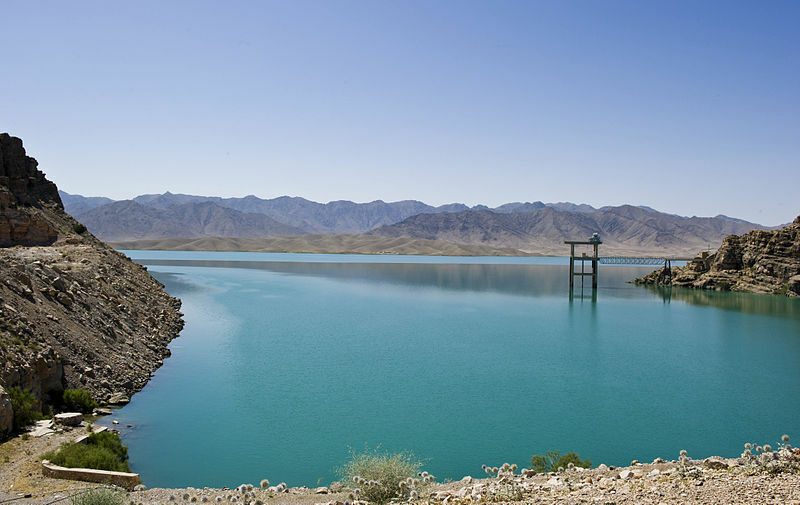 The US Agency for International Aid has decided against completing a $266 dam project on the Helmand River, reports Rajiv Chandrasekaran for the Washington Post. "The dam is one of many reconstruction projects, once deemed essential, that are being scaled back rapidly and redesigned in the waning days of America’s long war in Afghanistan as troop reductions, declining budgets and public fatigue force a realignment of priorities," Chandrasekaran writes. USAID will pay for installation, but will give the money to an Afghan electricity company rather than a US contractor. Afghans will provide security, as requested by Afghan President Hamid Karzai. Many question if the dam will eventually supply more reliable electricity to Kandahar. USAID has described how a convoy of 4,000 coalition troops spent a week fighting insurgents to allow delivery of a turbine to the Kajaki Dam in 2008. Three years later the turbine was still not installed, according to a report by Zainullah Stanikzai for Pajhwok Afghan News. Economic development in the country depends on security. Responsibility for security, as well as success or failure of the dam project, now rests with the Afghan government. Following a trend evident throughout Asia and around the globe, Afghanistan has seen its fertility rate drop. "The average number of children Afghan women can expect to have in their lifetime fell from 8 in the 1990s to 6.3 in the mid-2000s and to 5.1 at the end of the decade," suggests a USA TODAY analysis of the country's birth data. New emphasis on health care and education have contributed to the decline in the birthrate. The country's infant mortality rates have also plunged. 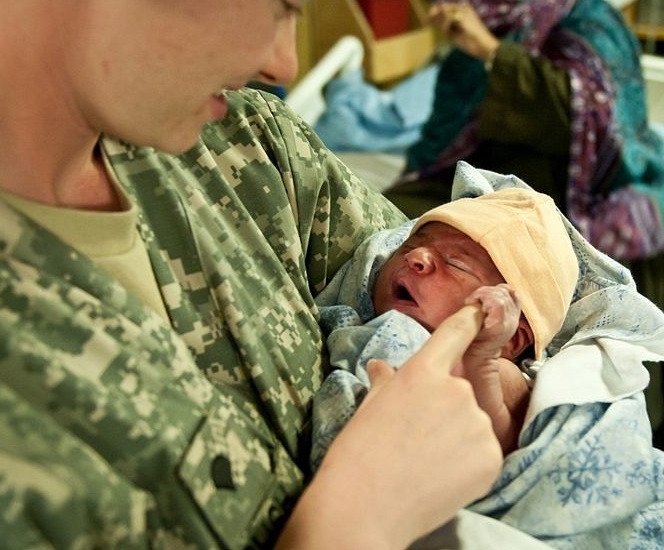 Photo of Afghan baby delivered by Caesarean section, courtesy of DVIDSHUB and Wikimedia Commons. Women are not shown in Afghanistan's elementary school textbooks. "An accurate representation of successful women presents children with the realistic message that no country can progress if half its population is invisible in the social, economical and political scene," writes Noorjahan Akbar for UN Dispatach. "If we want to change gender roles in Afghanistan, a good place to start is with the textbooks." Afghanistan has enough troublemakers who do not want gender roles to change - or at least they expect women to work and get no credit for what they do. Even Dari books for children produced outside Afghanistan are sparse on images. Still, the children are eager to learn. 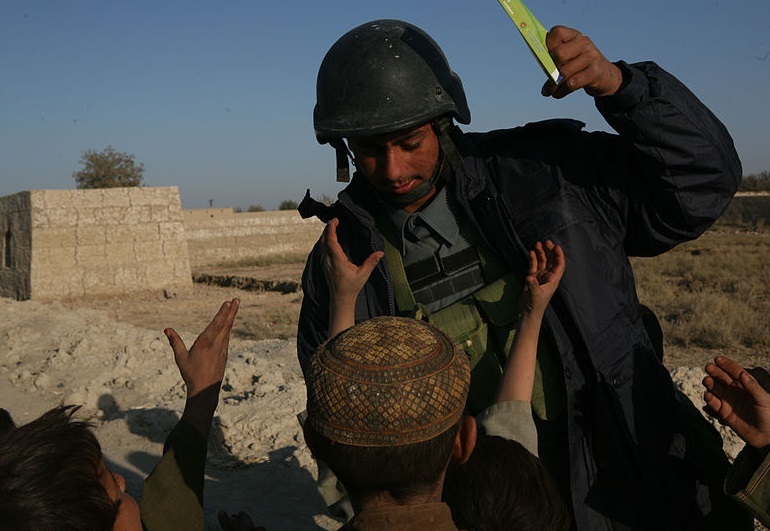 Photo of Afghan National Police offer distributing coloring books, courtesy of Wikimedia Commons and US Marine Corps.